Well, it has been a while, because I or Godpapa have been doing almost all the cooking from Slimming World recipes, and so far, since March I have managed to lose 11.5 lbs, and so I'm extremely happy, and hardly ever hungry. I'm not going to explain the SW ethos or method, it is easy enough to sign up online or join your local club! However, I do crave a little something sweet from time to time, and obviously home made is far better as you know what's gone into it, and I've even been known to sit and CALCULATE the Syn value of every ingredient in a cake, add them up, then divide that by how ever many portions we've served and usually it's a perfectly decent number. On the SW plan you are encouraged to have between 5 and 15 Syns a day, and that makes it much easier to not feel deprived! Anyway, thanks to my Dad, we recently discovered a super new gluten free biscuit cereal - Nutribrex - and I really enjoy it, however, it isn't on the list of "allowed" breakfasts, tho each biscuit is only 3 Syns, so I sometimes have one as an included treat snack just before bed-time. Today I had some bananas which everyone was refusing to eat, and I stumbled upon this lovely recipe from the Australian blog The Organised Housewife, so it seemed like a super plan. I suddenly remembered that Australian cup measurements and tablespoons are different from American and UK ones, (US cups are based on the imperial 8oz cup volume, and the Aussie cup is based on the metric 250ml volume.) If you want exact conversions, feel free to google it and weigh the flour out, but I just used my American cups and heaped them a little! Now, the beauty of this recipe is that it can be converted so many ways! 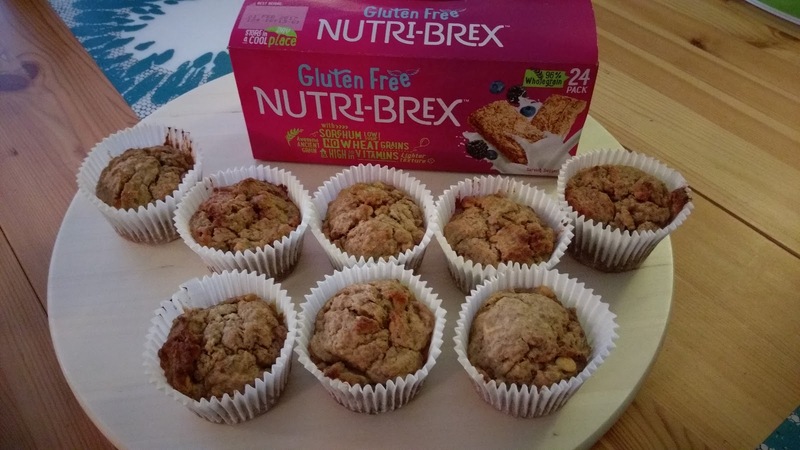 Using the Nutribrex, and if you use Doves Farm (or any other) gluten free flour, you can make this a gluten free treat very easily. Using Pure and a non-dairy milk you can make this dairy free. Using actual Weetabix (or shops own variation) and sweetener, and low fat spread, you can easily make this a very low Syn treat (if using the biscuit cereal as your HEb) Anyway, however you make it, MAKE IT, it is easy, delicious and fun for the kids to help with too. 4 Weetabix style biscuit cereal bix. I would have added cinnamon but Big'Un says she no longer likes cinnamon. I'm glad I didn't tho. Heat up the oven to 180-200 degrees. You know your oven. Line a 12 hole muffin tin with muffin papers. Get the kids to crush up the cereal biscuits in a medium sized bowl. They will LOVE this. Or do it yourself and get some anxiety out! Add the bananas, and then the milk. Mix well and leave to stand for 10 minutes. In a LARGE bowl, beat together the butter/marg with the eggs. Don't worry if this is a weird texture like you sometimes see in the clouds on summer evenings, it will work. Add the banana mixture, and fold it through. Add the flour, sugar and then the choc chips and mix until just combined, and spoon the mixture into the prepared muffin cups. Bake until golden and a skewer comes out clean, about 20-30 minutes depending on the size of the muffins. We found it actually made 12 cakes, we never get the amount stated in the recipe, but this was SPOT on. Really tasty, and a lovely texture. And I wouldn't have a problem serving them for brekkie really either!